At Müller Fresh Food Logistics, all our services are closely integrated with each other and we make use of the technical capabilities of the future. We go that step further in transport and distribution. What does that mean for you as customer? A reliable logistics partner and a continuous flow of digital information. For small and large shipments, in the Netherlands and abroad! 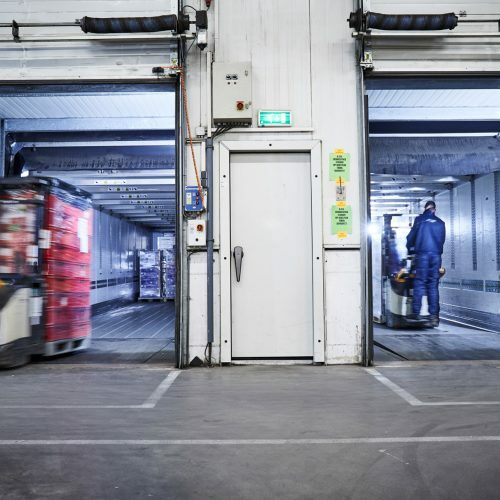 With its Europe-wide network is Müller Fresh Food Logistics your partner for pick-ups and deliveries. We can also offer occasional deliveries, flexibly and at very keen rates. Our delivery vehicles drive across Europe every day. With perfect cooperation and a long-standing European network, we offer all our customers a one-stop-shop model. Müller Fresh Food Logistics has a strong network for the international transport of full truckloads (FTL). Our shipping department is in daily contact with customers throughout Europe. We can offer regular pick-ups and deliveries, but also occasional deliveries. With our refrigerated trailers we can guarantee loads under all conditions from -25 ºC to +25 ºC. Müller Fresh Food Logistics distributes chilled and frozen foodstuffs in Europe. 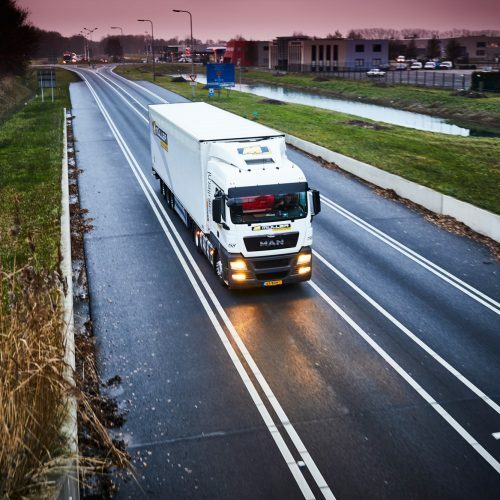 Our focus is on Benelux and Germany, where we deliver products daily to the distribution centres of retailers, wholesalers, foodservice channels and industry.Our advanced Track & Trace system enables us to determine the position of a load in real time and to monitor the temperature of a pallet every step of the way. Your pallet, full truck load or local package delivery takes place in a closed and controlled refrigeration chain.We offer you the option of transporting large and small shipments by Groupage. 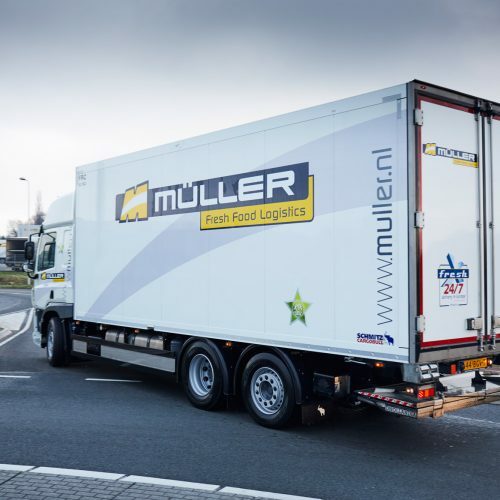 Müller Fresh Food Logistics has over 250 trucks, so we can always respond flexibly to your requests and wishes and those of your customers. We have a high accessibility trough an extensive fleet of vans, trucks and citytrailers. We have nationwide coverage for local distribution. By combining and pooling shipments we can keep the costs as low as possible. Our establishment in Roelofarendsveen is specialised in frozen and also the ideal location for making deliveries in the Randstad and the inner cities (Amsterdam, Rotterdam, The Hague and Utrecht).